I won’t lie: I love owls. What’s not to love? They are incredibly trendy right now, and there is a slew of adorable picture books out now featuring these wide-eyed nocturnal characters. Fellow owl-aficionados of all ages will undoubtedly enjoy this picture book. The bold colors draw the eye and the story is simple, yet engaging. Little owl, in a fit of snoozing, falls out of his nest and bonks down to the ground below. Alarmed and alone, he does what any kid would do: he looks for his mommy. A squirrel with good intentions but questionable observational skills assists the young owlet in his quest. She’s big? Here’s a bear! She has pointy ears? Here’s a rabbit! Big eyes? Here’s a frog! Finally, frog helps and wait…there’s cookies! Hooray! Children will enjoy the silly squirrel’s guesses as to who Mommy is, and adults will enjoy the retro illustration style. Young children enjoy repetition (as any parent or caregiver can attest) and the text is simple, yet predicative. It’s silly, and comforting to them when Mommy is at last found. 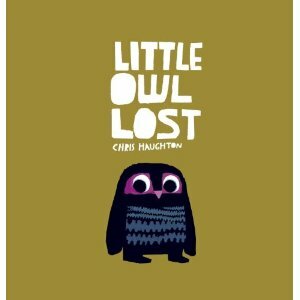 This is Chris Haughton’s first picture book. This entry was posted in Books and tagged chris haughton, Flora and Fauna, Little Owl, Nature stories, Owl, Picture book, Wildlife by S.D. McPhail. Bookmark the permalink.